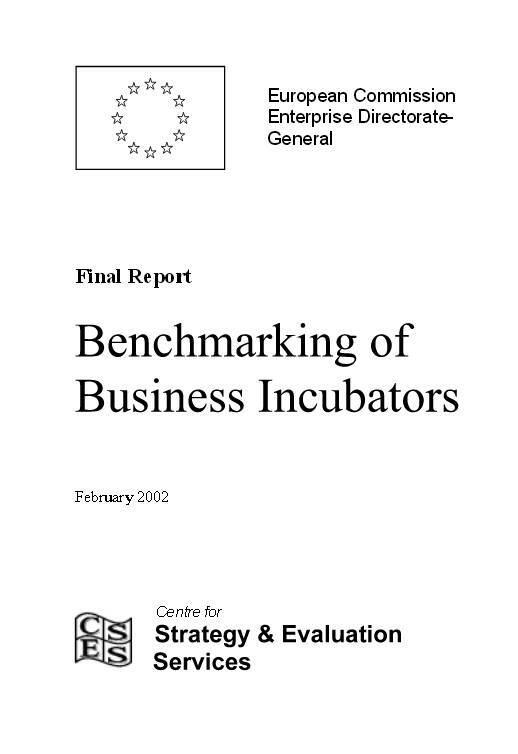 The project Benchmarking of Business Incubators was undertaken for the European Commission by the Centre for Strategy & Evaluation Services (CSES). The objectives of the project were, in summary, to: Define ‘headline’ benchmarks for business incubators relating to their performance with regard to management and promotion; Support this with ‘operational’ benchmarks’ that define the means of achieve the ‘headline’ benchmarking performance; Provide assistance to business incubators that participate in the exercise to implement operational improvements by, amongst other things, producing guidance on achieving benchmarked performance and examples of best practice. The work carried out by CSES involved two main phases: Phase 1 focused on preparing an analytical framework and involved a review of previous research and other literature on business incubator activities. During Phase 2 the framework was tested and further developed through a series of interviews with incubator managers, stakeholders and client companies from the EU Member States. Posted in Business Intelligence, Clusters & Incubation, Digital Economy, Economy, Entrepreneurship, Global - Europe and tagged analytical framework, benchmarked performance, Benchmarking of Business Incubators, best practice, business incubator activities, Centre for Strategy & Evaluation Services, client companies, CSES, EU Member States, European Commission, headline benchmarking performance, headline benchmarks, incubator managers, management and promotion, operational benchmarks, operational improvements, producing guidance, provide assistance, stakeholders.